Sue is an accomplished dental hygienist who’s been with the Portmore team since 1999. 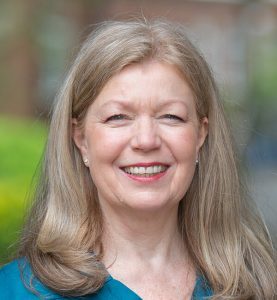 She spent 12 years as a dental hygiene tutor, becoming deputy principal at Guy’s, Kings College and St Thomas’s teaching hospitals in London. A large part of her role at Portmore involves talking to patients about their oral hygiene regimen and helping them improve aspects of their self care including flossing, dietary advice and smoking cessation. She delivers a range of hygiene services including special cleaning for dental implants and patients wearing orthodontic devices. She also provides teeth whitening. Sue’s background includes working in and teaching dental hygiene abroad and she’s been active in sharing knowledge in her field through published articles and presentations. As part of her dedication to her work she keeps up to date with the latest developments and research in oral hygiene, because she regards oral hygiene as a fundamental part of a healthy and happy life. Sue is passionate about sharing her knowledge with patients because she wants the best for them. When she’s not working, Sue loves travelling.